Jack Monroe got monstered by Richard Littlejohn in the Daily Mail. This is of course something Richard Littlejohn does on a regular basis. I’ve read your trash non-journalism ‘comment’ piece about me in the Daily Mail this morning – not because it is a newspaper I read, but because a friend forwarded it to me. Firstly, I have to commend you for managing to get 20 facts completely wrong in a comparatively short article. But that’s your style isn’t it – never let the truth get in the way of a good smear campaign, or something like that. This morning, if you search Twitter for “Richard Littlejohn”, @MsJackMonroe is the first listing – Richard Littlejohn himself comes in third. But the Daily Mail and Richard Littlejohn will doubtless see traffic go up from all the people linking to his column: and they don’t care whether it’s negative or positive linkage, because the profits for the MailOnline website are the same in either case. On Tuesday 8th January, Suzanne Moore’s essay on the power of female anger went up on the New Statesman website. I read through it, liked it, winced at one line in it, and glanced at Twitter and saw I had not been the only one to like, but to wince. I also saw Moore’s reaction to the polite criticism she was getting, and I thought “Someone should explain to her why this is going to get people upset” and in this spirit (and because it seemed an appropriate article for LGBT.co.uk, for which I am contracted to Write Stuff) I wrote No, Not Moore Transphobia, pointing out too that a conversation about #TransDocFail had been going on before the article with the unfortunate line about “Brazilian transsexuals” went online. I swear, I thought this was all going to calm down within a few days. Suzanne Moore did get a couple of very awful tweets (“cut your face off” / “you should have your head cut off”) were, while not (in my view, and I wouldn’t blame Suzanne Moore for differing in that) serious call-the-police threats, they were wretchedly unpleasant things to get – as unpleasant as the “cut your dicks off” line Moore tweeted – and I blocked both of the senders. But, most of the comments Suzanne Moore was getting initially were on the lines of “That line about Brazilian transsexuals is problematic” and I thought that once she cooled down, read the open letters and blog posts written by women for whom (I assumed) she could feel nothing but respect, she would have to admit; she screwed up. What I didn’t think of either – and should have – was that the situation for trans women in Brazil was not going to get any better just for Suzanne Moore taking up all the media attention possible and claiming this was all about her hurt feelings. The distress of the privileged is real distress, even if it is different in scale from injustice. Moore was celebrating the anger of women: shouldn’t she get that anger is splendid even when it was directed at something she wrote? “The last twelve months have been lit up by moments that will stay with us forever. When Mo Farah approached the final stretch of the 10,000m final, who wasn’t up on their feet, screaming at the TV? “When Nicola Adams beamed at the crowd after winning the first ever women’s Olympic boxing, who didn’t smile back? I was lucky enough to be there, and that’s one I’ll never forget. “Was there anything more British than that drenched choir in the Jubilee River Pageant, singing Rule Britannia! in the pouring rain? Sadly, none of them involved the Liberal Democratic party or its leader. To be able to form a government the leader of the largest party in the House of Commons needs to be able to count on a minimum of 326 votes: otherwise, as soon as the government does something which the opposition cannot approve of, they can hold a vote of no confidence which the government will lose: Parliament is dissolved, a general election occurs. The median age of the population of the UK is 40.2: the last time there was a general election called in those circumstances was October 1974. Over half the population are not old enough to remember this except as a historical report: no one under 56 is old enough to have voted in 1974, the year of two elections. Gordon Brown would have been 23 that year. Ed Miliband wouldn’t yet have been 5: Nick Clegg was 7: David Cameron would have been 7 at the time of the first General Election in 1974, and the second happened the day after his 8th birthday. I was inspired to write this, if that’s the word, on reading Fleet Street Fox on the Leveson Report: The devil is in the detail, published yesterday in the Press Gazette. It’s a fine example of a rant as you will ever find from an MP explaining with tendentious authority why the general public have absolutely no right to know about their Parliamentary expenses and how it will ruin a free democracy if this is allowed: you would think this was an investigative journalist who sees censorship on the cards, not a fox demanding the right to be unmuzzled in the henhouse. 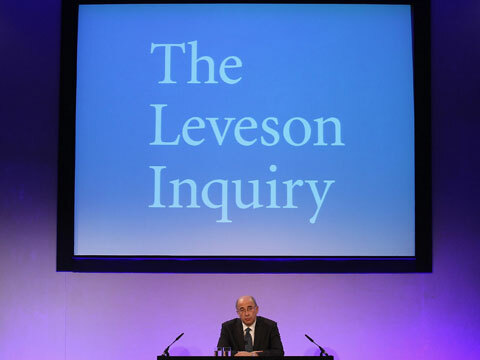 But the devil is in the detail, and the detail of Leveson is the bit which will muzzle the Press as effectively as Hannibal Lecter strapped to a luggage trolley. Leveson wants this backed up by law which is plain wrong, because there’s no bill ever passed by Parliament that wasn’t tinkered with later. Hacked Off and other campaigners may feel the suggested law is fine, but it’s the law it may mutate into which is why it should never happen. So, we can’t have laws in the UK, because however nice a law looks when it’s proposed, Parliament may change it into something unspeakable, so all laws are wrong. We should instead trust to the kindness and gentility of the likes of David Grigson. Okay. That’s nice, Fox. We should live in a lawless society because we can’t trust Parliament. Let me answer a simpler question. When is muzzling the Press appropriate and can you recommend a certain kind? By and large, muzzles are used to keep the Press from biting or causing injury. There are two types of muzzles: prohibitive (also referred to as the “tyrant’s muzzle”) and regulatory. In the 2012 council elections, in quite a few wards the SNP decided to improve their number of seats on the council by breaking the musical chairs rule: instead of having just one party representative per ward, they had two. They made a number of bad strategic decisions (not least, presenting themselves as the male pale stale party in the last election before they have to convince women voters in particular that independence is worth voting for) but this one was kind of obvious. The SNP also made the mistake of assuming that voters would remember their individual councillor and vote for him specifically (in the SNP, it’s usually a him). In my ward, the SNP council election leaflets suggested voters put “1” next to the second candidate, new man Adam McVey. (They did suggest people put “2” next to the previous councilor, but people don’t rank the same party “1” and “2” on their ballots…) Consequently, Adam McVey got in, and the previous SNP councillor lost his seat. The same pattern seems to have repeated itself in Heldon & Laich ward in Moray, with variations typical of locality – the previous councillors had been three men, a Conservative, an Independent, and SNP. Carolle Roberts, who had been involved in the campaign to keep the local RAF base open, was chosen to run as the SNP’s “other candidate”. And won.